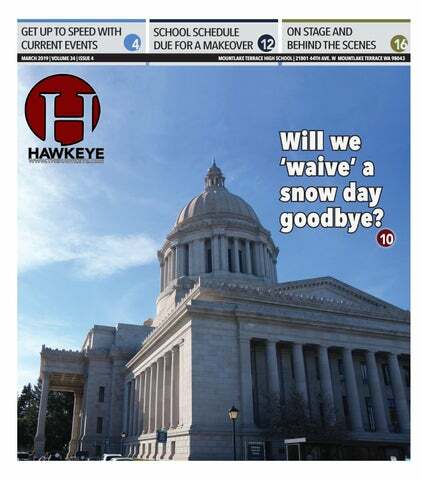 Will we ‘waive’ a snow day goodbye? Stay current with news about meddling in college admissions or a Boeing plane crash. Staff reporter Ritika Khanal shares the lessons learned from being visually-impaired. Immigrants are more than their stereotypes, says staff reporter Nina Otebele. Calendar extension keeps students--and graduated seniors--in school until near July. School days may not have six periods, due to the need to acquire 24 credits. An extra step for students, a little less hassle for counselors. Citizens await on Light Rail expansion to hit Washington cities. Junior Peja Shymko has a love for packaging the hottest plays and musicals. Cut-outs of Assistant Principal Dan Falk appear hidden around the building. Community members step up to deliver meals during snow troubles. Senior Michael Malysh experiences a terrifying drop during a March 1 demonstration of a virtual reality roller coaster by Seattle-based tech startup Chronos Global Academy. The Hawkeye’s mission is to provide the MTHS community with quality, thought-provoking student produced publications. Since 1960, we have faithfully served our audience and community as an open, public forum where student editors make all decisions. In policy and in practice, the Hawkeye is a designated open forum publication. Bruno Porras, Caroline Erdey, Hank Belanger, Jonathan Savell, Lin Miyamoto, Nathaniel Reyes, Nhung Lam, Nina Otebele, Raymond Smith, Ritika Khanal, Sovanrom Sot, Teresa Bonilla, Theresa Van Name in bold indicates staff member of the month as selected by the Editorial Board. Vince DeMiero, Mike McLaughlin and Tyler Hartung Journalist-in-Residence Samantha Pak FANs Coordinators Sandra Merten & Cathy Fiorillo Printer Pacific Publishing Member of MTHS ASB, JEA/WJEA, NSPA, Student Press Law Center, Tao of Journalism Editorial Policy The editorial section of the Hawkeye, including editorial cartoons, serves as a forum for well-written, thoughtful, longer forms of expression. Signed editorials represent the opinions of the author. Unsigned editorials represent the opinion of the Hawkeye Editorial Board. Views printed herein are meant to be opinionated and do not necessarily represent the opinions of the Hawkeye staff, student body, faculty, administration or school board. The Hawkeye will print submitted guest editorials as space allows and requests that all contributors include their name, signature and position relative to the editorial. The Hawkeye will edit all submissions for accuracy, spelling and grammar. We reserve the right to refuse to print any submission. Letters to the Editor Policy Readers are encouraged to voice their opinions in the Opinion section, a public forum for the expression of varying viewpoints on relevant topics. The Hawkeye will print as many letters as space allows. Letters must include the author’s name, signature and class or position relative to the letter. Typed or legible, hand written letters are acceptable, but should not exceed 200 words. The Hawkeye will edit all letters for accuracy, spelling and grammar. We reserve the right to refuse to print any letter. Advertising Policy The Hawkeye will not accept any advertising that the Editorial Board deems to be: factually inaccurate; designed to mislead, deceive or defraud; containing malicious, vindictive or unsubstantiated attacks; offering goods and/ or services illegal for teens to possess, buy or use; libelous; obscene; creating imminent danger or disruption to school. The Hawkeye reserves the right to refuse any advertising, solicited or unsolicited. 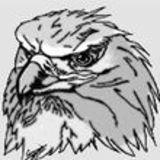 Advertisements do not necessarily reflect the views or endorsements of the Hawkeye staff, student body, faculty, administration or school board. COVER PHOTO ILLUSTRATION BY JONATHAN KWONG AND RAYMOND SMITH © 2019 HAWKEYE | ALL RIGHTS RESERVED. reproduction in whole or in part without permission is prohibited. Abdul Aziz, a 48-year old Afghanborn furniture store owner, drew praise for running towards gunfire and possibly warding off a shooter during the March 15 shooting at the Linwood mosque in Christchurch, New Zealand. His actions may have helped prevent more deaths. A Turkish-born gunman opened fire on public transport March 18 in Utrecht in the Netherlands. Some suspect the shooting stemmed from a familial dispute turned violent. President Filipe Nyusi of Mozambique claimed that more than 1,000 people may have died following the devastating strike of Cyclone Idai in Central Mozambique that flooded rivers, creating what one UN official referred to as “an inland ocean.” The current confirmed death toll is 89 in Mozambique and 215 in total. Student demonstrations were held in over 92 countries on March 15 to protest against the lack of government action against the threat of global climate change. Hawkeye A lot happens in a month. From fashion to finance, we are constantly bombarded by headlines from around the world. Here are the Hawkeye’s picks for what you need to know. HUB, 6 p.m. Aux. gym, all day Theater, 7 p.m.
Theater, 6 p.m. 1st through 4th per. Bremerton High School, all day Library, 7 p.m. Aux. gym EWHS, 2-5 p.m. Aux. gym Aux. gym Mountain View HS, all day Theater, 7-8:30 p.m. PASS Theater, 7-9 p.m. Theater, 7-9 p.m. Gym Gym Theater, 7-9 p.m.
MAR colorful clothing. Thursday is class colors! A beauty pageant for all to attend. APR Terrace’s two concordant choirs. APR gram puts on a swingin’ show. APR Terrace’s STEM students on display. John Bercow, speaker of the United Kingdom House of Commons, has told Prime Minister Theresa May that the latest version of her twicedefeated Brexit deal will not be voted upon until she makes substantial changes. Britain is scheduled to leave the European Union on March 29. The Poarch Band of Creek Native Americans donated over $184,000 to the families of victims of the recent Alabama tornado outbreak. The March 3 tornado outbreak resulted in 40 confirmed tornadoes across the Southeast, killing 23 and injuring over 100. Over 750 families benefited from a college cheating scheme that impacted several top universities, according to the FBI. The FBI has indicted 50 people allegedly involved in a $25 million plot to fake test scores and bribe officials at top universities including Yale, Stanford and the University of Southern California. A federal appeals court ruled in a 3-0 decision on March 13 that Michigan woman Debra CruiseGulyas had her constitutional rights violated in 2017 when a Detroit police officer issued her a speeding ticket after flipping him off. n Dec. 7, 2018, at Lake Brantley High School (LBHS) in Altamonte Spring, Fla., students were at lunch when the intercom announced a “Code Red” drill, simulating an active shooter lockdown. The only issue: there was no indication of it being a drill, sending students into a panicked frenzy. According to the Orlando Sentinel, teachers at LBHS were also unaware that the Sierra Clark Code Red was a drill when they GRAPHICS EDITOR received a text message reading “Active Shooter reported at Brantley / Building 1/ Building 2 and other buildings by B Shafer at 10:21:45. Initiate a Code Red Lockdown.” The lockdown lasted about an hour before the school’s administration clarified on Facebook that it was just a drill – that the threat was not real. Since the lockdown, the Seminole County Public School District has changed its policy and no longer performs this type of drill. According to local NBC affiliate WESH2 News, students were blamed for the panic, while the students, “believe that miscommunication about a message that went out of the loudspeaker at lunch is to blame.” This want for blame and sense of terror sounded all too familiar to me. I thought that MTHS was an outlier in this, and maybe it was at that time. But not anymore. I was already at school on June 7, 2018, when I got an influx of messages on Snapchat from fellow MTHS students. The messages all relayed the same macabre information: “There was a shooting threat against the school.” Of course, I didn’t take it completely seriously with the numerous threats and fire alarms that had already happened that week. But this one felt a little different. People were already signing out and going home. Many more would do so later. It felt different from the rumors of a threat from earlier that week or even earlier that year. It was more serious than the etching of a weapon above the date “6/5/18” into the boy’s bathroom stalls. It felt more real than the photo of bullets with an added caption of “watch out Terrace’ spread around the MTHS community on January 4, 2017. It felt more dangerous than the time when a student brought a pellet gun to MTHS on January 6, 2017. I can’t say that having a visual impairment doesn’t have its challenges. Little things that are normal to the rest of the world can be huge challenges for me. For example, most people don’t spend weeks learning how to navigate a new environment. Most people don’t find it difficult to hop on a website to research an assignment. Most people don’t have insecurities about moving from point A to point B for the fear that one little veer could lead to a completely unknown space. Sometimes, overcoming the challenges can be exhausting, but I’ve found there is always a way to get around those challenges if I want something enough. However, it truly does take a village, and I’ve been extremely fortunate to have incredible support from all fronts throughout my years of school. For as long as I can remember, I’ve always had at least one Braillist who converts material into Braille when I need it, and an orientation and mobility instructor who helps me learn to navigate the physical world independently. I’m also extremely fortunate to have PHOTO BY TERESA BONILLA | HAWKEYE peers who accept me for who I am, and incredible day-to-day LCA is a retinal disease in which little to no light teachers who do everything from modifying assignments to can be perceived. The disease is usually present at birth, but describing videos the class is watching. only about one in every 100,000 children are born with it. Without their support and encouragement, I would never There are about 20 different forms of the disease and only be able to get past some of the obstacles I face, and I am one person with each form at any given time, making it difalways grateful to them for all they do. ficult for doctors to test for cures. When I meet people for the first time, it can be hard for Though gene therapy (a surgery in which the necessary gene them to know how to act around me. Without even realizing is injected into the eye) has cured a few forms of LCA, a lot it, they often either talk to me as if I can’t hear, ignore me of research is still being conducted for the many forms not completely or direct their sentences towards whoever is closcured yet. est to me. When I first came from Nepal, I couldn’t see how I was When you have had something all your life, it’s hard to going to fulfill my dreams of going to school. Two months imagine life without it. Therefore, I know people into my first year at Hazelwood are curious about how I do what I do. Most peoElementary, however, I had discovered “But why?” my threeple feel weird asking me about something related the miraculous world of braille. year-old brain asked to my blindness because they think the question I was now on the same playing field itself. The answer was might be offensive or a “stupid” one. as my peers. It no longer mattered that just as unsatisfactory As they get to know me though, they discover I couldn’t read and write with my eyes, each time: “Because I am very open to questions and will answer you can’t see.” because a six-dot code gave me the anything. chance to do it with one fingertip. My Just like it’s hard to imagine life without somedream of going to school and learning thing you’ve always had, it’s hard to imagine life with somewith my peers was coming true, and I was hungry for more. thing you’ve never had. I’ve never had sight, so while having By third grade, instead of using an eight pound braille it would make things easier for me, life without it is the only typewriter for assignments, I found myself typing up my life I know, and I see it as a chance to change the way the assignments using an Apple wireless keyboard and a built-in world sees people with disabilities. accessibility feature called Voiceover on an iPad. I see it as a chance to educate others and show that at the Soon, I was learning to use different screen readers on comend of the day, we’re all humans, and we’ll always have that in puters, printing my assignments from a braille tablet, and common. H mixing technology to do all of my school work. magine one day, you wake up to find the world has been stripped of all color and shape. All you are left with is the light of day, the darkness of night and the outline of a person if they are standing right in front of you. If you can imagine this, then you are imagining how I see the world every day. As I grew up in a predominately sighted world, I quickly realized I had something to prove. No one in my Ritika Khanal native country, Nepal, had ever been HAWKEYE STAFF around a visually impaired person. I was “different.” No one knew what to think, how to act, what to expect. There weren’t very many people who thought I could make anything out of myself due to my blindness. Ever since I was little, the thing I wanted most was to go to school. I saw it as my one chance to prove to anyone who had doubted me that I could make something out of myself. Out of the 15 or so Nepali schools my family and I looked into, only one was willing to accept me. All of the hope I had been holding onto shattered at that point. Maybe everyone had been right. Maybe there really was no place for me in the world. “But why?” my three-year-old brain asked itself. The answer was just as unsatisfactory each time: “Because you can’t see.” At the age of four, I was brought to the United States to see if anything could be done for my vision. That’s when I was diagnosed with Leber Congenital Amaurosis (LCA). The fact that we have a president who isn’t open minded to the many reasons why people immigrate to the United States is unacceptable and ignorant. days to be called. She believes “student and members of district facilities and the opera“Having some of the snow days built into staff safety is a top priority,” but now strugtions department. The Communications and the calendar would be nice,” she said. “I’ve gles to keep her curriculum on track. never really liked that we add all of our snow Public Relations Department at the district “It’s making me have to make the decisions then sends out snow day notices through days at the end because we get out late.” about content that I might teach differently emails, phone calls, texts, social media and She has a friend who teaches in Michigan, or speed through a little bit,” she said. local news outlets. Franson said there’s only a where snow is more prevalent. Frost is interAs an Advanced Placement teacher, Frost 10-minute turnaround from the PR departested in their work-from-home process that worries if her students ment learning about a snow day to notifying eliminates the need to “[Students] have to be more will be ready for the families in the ESD. add more school days. responsible for their own national AP exams in For Torres, she would have liked to This approach is posreading and learning.” May, which can grant received the snow day alerts more in advance sible for the Michigan college credit. and thinks there is room for improvement. school district in which Amy Frost SOCIAL STUDIES TEACHER “[Students] have to “I think giving us a heads up earlier in her friend works because be more responsible for the day would be really good,” she said. all students have a distheir own reading and learning. We have all “Sometimes it was pointless to call a half day trict-issued laptop, similar to the ESD. of that time after the AP test which is really [when] we could have just had no school.” “They aren’t making them up because their not useful in terms of helping them perform In the meantime, the ESD is working on district is a one-to-one district, so teachers on the AP exam,” Frost said. “For me, as are expected to put up a lesson plan or have incorporating additional school hours for much instructional time as I can get prior seniors to attend after graduation. However, a lecture, and students log in and do some to the AP exams in May, I would be happy it’s not the first time the ESD is offering work, so we actually are teaching and learnwith.” extra school days. ing,” Frost said. Schwab agrees that education may take a “I think we had to do this in 2006-2007 Over time, the ESD has implemented more hit from the lack of school, but he thinks when we had a bunch of snow days. We had ways to relay the message about school canstudents can catch up. to offer days for seniors to come back after cellations or delays. “Any time you miss this much school, there graduation,” Schwab said. “We had to at “The goal is to put out the notice as are gaps in instruction and teachers have least make it available for students.” many ways as possible,” Communications curriculum and content they have to cover. As he was MTHS principal at the time, Specialist Kelly Franson said. How do we get back up to speed again and Schwab doesn’t recall too many seniors The superintendent makes the snow day get running as quickly as possible?” he asked. decision based on recommendations from returning for that opportunity. “I think we will and it’s gonna take some Now, the ESD is looking to receive a a team consisting of the transportation time.” response about a snow day waiver. H service director and bus drivers, as well as Just days before the “snowpocalypse” hit the area, Schwab sat back and thought the ESD would “escape the year without a snow day.” “This is pretty amazing,” he said. In fact, the National Weather Service noted that Seattle has never seen this much snow in February since 1945. Because the Puget Sound area doesn’t typically receive large amounts of snow, the ESD has a limited supply of tractors and snowplows on hand. They contracted with private companies to clear snow from schools. In I would help out these inclement weather conditions, district workers helped de-ice and plow roads. Above and shovel the all, the ESD determines snow days based on accessibility and safety. freakin’ snow out “Ultimately, the decision that we make for snow days is always based on student and the driveway so staff safety,” Schwab said. “Those are always our overriding concerns, and we know that that people can people may not be happy with the decisions the school district makes, but the decisions go to school! that we make are always grounded in what’s safe for students and for staff.” Some students and parents expressed both praise and concern for the snow day decisions on social media. Torres, for example, suggested distributing snow make-up days more evenly throughout the year. “Maybe spacing them out across the rest of the school year instead of packing [make-up All the buzz: Members of the MTHS community days] into the end,” she said. voiced their opinions about snow days on Instagram. Frost recommended a similar idea. How would YOU handle and determine snow days if it was your job? The bill adjusts the number of credits required for students to graduate. CANNOT FAIL A CLASS and still graduate on time . “That gives teachers a year to adjust, if it’s a block schedule or trimester it will require different instruction standards and a lot of work to get prepared for,” Schellenberg said. “I think the decision will be made by the end of this year and then there will be one year to prepare.” Additionally, changes will not be implemented immediately due to several concerns the district has concerning the impacts generated by moving away from the six period day. “I think the major concerns are going to be cost,” Schwab said. “There will be a cost associated with a schedule change. But again, our board is very committed to this process.” Schwab also reemphasized the preparation period the district must allow teachers before entering into a new schedule format. “We need to make sure there is time to provide training and professional development for staff as the prepare for a change,” Schwab said. The district is aware of the potential issues that an alternating block or trimester system would generate for students preparing for Advanced Placement exams in May, and they are researching ways to minimize any barriers to student success. They are currently looking at ways in which surrounding school districts have attempted to minimize the effects of scheduling changes on AP students. “For example, the Federal Way SD has all four of their high schools on an alternating block schedule and they have come up with ways to support AP students’ needs to be prepared for the tests in May,” Schwab said. THREE ALTERNATIVE SCHEDULE SYSTEMS to give students more credit opportunities. An abundance of food items that volunteers packaged into meals, which were sent out the week after the Nourishing Network was unable to send out meals due to snow. PHOTO COURTESY OF THAME FULLER. Work with world class faculty in a field you love at an affordable price. Start your Triton journey now at edcc.edu/getstarted. We’re always looking for a few good… WRITERS • PHOTOGRAPHERS GRAPHIC ARTISTS • SALESPEOPLE WORDPRESS GURUS • EDITORS DESIGNERS • INTERVIEWERS VIDEOGRAPHERS • COLUMNISTS BLOGGERS • WEBMASTERS LEADERS • ORGANIZERS TEAM PLAYERS • THINKERS WORKERS • INDESIGN EXPERTS EVENT MANAGERS • INNOVATORS MARKETING MASTERS • PLANNERS REVIEWERS • CRITICS • ETC. Know any? What about you? Come see us any day after school in room 130. There’s never been a yearbook like the 2019 TEMPO. The deadline to reserve your copy is March 29. Purchase yours today in the fines/fees office. When they’re gone, they’re gone. The TEMPO. The March 2019 issue of Mountlake Terrace High School's student newspaper.